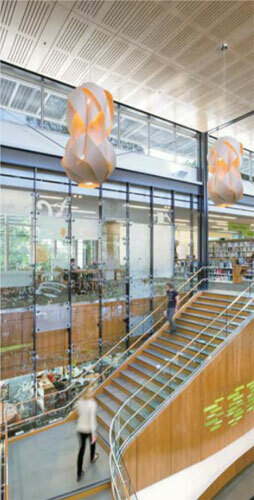 LEED-Gold library offers roomy, light-filled spaces along with ample square footage. The old public library in Los Gatos, Calif., had long been bursting at the seams. Built in 1964, the facility no longer had the capacity to accommodate the needs of the town’s population, which had tripled over the past 50 years. The new 30,250-square-foot LEED Gold-certified library, which opened earlier this year, offers residents almost triple the space of its predecessor. Berkeley, Calif.-based Noll & Tam Architects conceived of the building as a lantern. 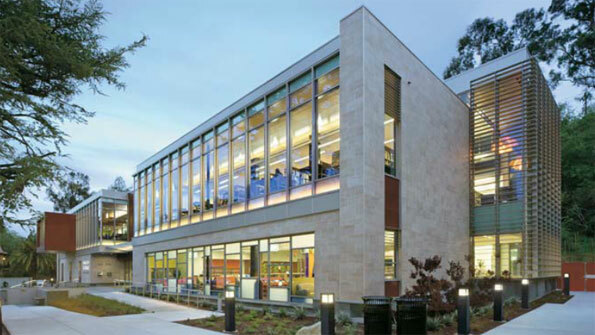 Nestled into the base of a wooded hillside adjacent to the civic center, the two-story library glows at night when lit from within. Organizing the structure as a long, narrow form along an east-west axis maximizes views and natural light during the day while minimizing solar heat gain. The interior features a 35-foot-high lobby atrium with a grand staircase that incorporates a work of glass art from a Northern California artist. The first floor also contains administrative space, a periodicals room, a café, a circulation desk and a children’s room. Designed to create a country club feel, the periodicals room has a fireplace, wood bookcases and dark paneled walls. The second floor contains most of the book collections, a technology lab, two group study rooms, a lounge, a history center and a teen area with a large bay window. In the public areas, a raised-floor HVAC system helps conserve energy. A bicycle rack and employee showers encourage use of alternative transportation. In addition, many of the building’s materials contain high levels of recycled content, including the steel structure, insulation, exterior and interior masonry, as well as the carpeting. Two digital monitors at the library’s entry showcase the sustainable strategies and display real-time tracking of water and energy consumption and the amount of solar electricity being produced. I think the old public library in Los Gatos was built in 1964, nearly 50 years ago. A wide range of books are available there and I had visited there few times with my friends. Thanks for sharing this with us and keep posting more updates in your blog.